Southern-Style Sausage and Cornbread Stuffing (or Dressing) | Let's Cook With Bry! To be truly Southern, it would be called “dressing” instead of stuffing, but this recipe was passed down to me by my Mom, a Louisiana native, and was passed down to her by her grandmother. So it’s about as close to being Southern as it gets. My Mom always made stuffing sandwiches with the leftovers. The day before, prepare 2 packages cornbread mix – I always use Jiffy brand because it contains LARD (this ain’t no diet food!) – according to the instructions (I combine both mixes and bake in a single pan) and leave it out overnight to harden a bit. 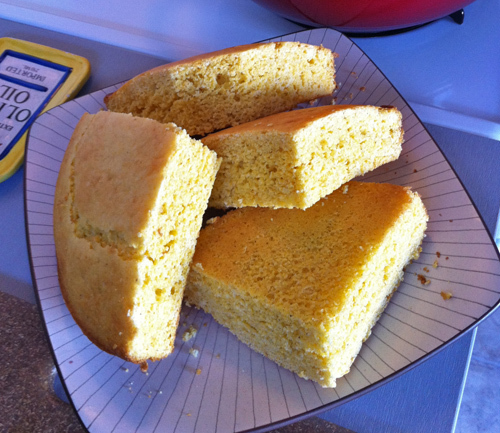 The cornbread should be stale, so that it will crumble. Also hard boil 6 eggs, which will be used in the stuffing. Assuming you’re making this to accompany a turkey, boil the neck and giblets with 1 carrot, 1 celery stalk, and 1 onion, adding the liver during the last 30 minutes. Replenish with water as needed. Strain the stock and reserve the liquid for the stuffing, and for the gravy if you’re making that as well. 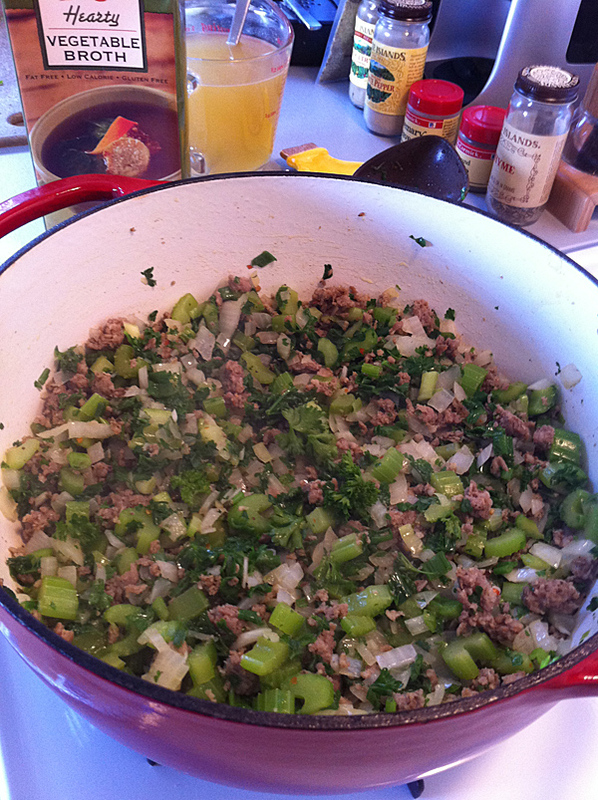 In a large skillet (cast iron works great), brown the sausage until crumbly, drain fat. Sauté celery, then onion; as it’s finishing add the green onion and parsley. In an enormous bowl (large and shallow works best for mixing), crumble the cornbread, and mix in walnuts, egg, half the bag of stuffing, and then the cooked ingredients. Season with spices to your taste. Continue adding stock and bagged stuffing until it’s reached your desired consistency – remember that this stuffing will be denser than traditional bread-based stuffing. The tricky part is getting just the right combination of dry and wet ingredients with the stock, which is achieved via experience and your own intuition. Spoon the stuffing into a baking dish, without pressing it in too much since it is already fairly dense (with this huge quantity you’ll likely have to use 2 or 3 dishes) and bake with the turkey, covered, for 40 minutes to an hour depending on the size of your dish. 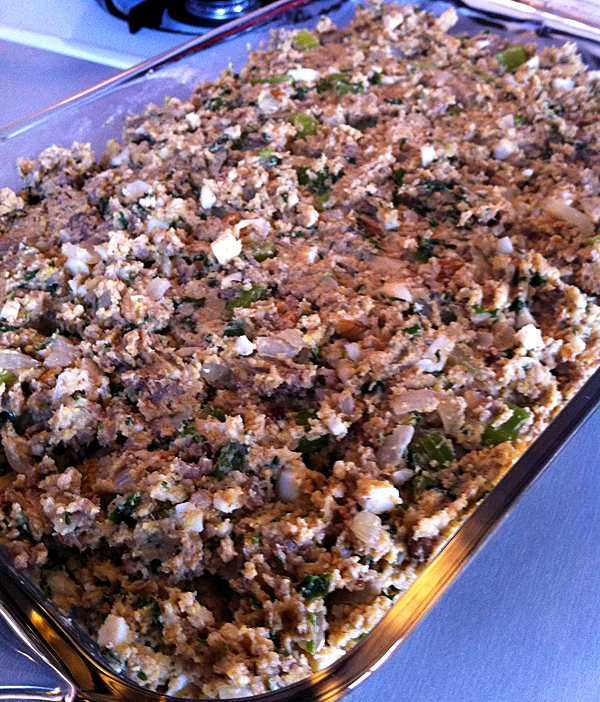 The stuffing will take on a darker shade of brown when it is ready.